The Boise River Wildlife Management Area above Harris Ranch provides winter habitat for more than 7,000 deer, the number depending on the severity of the winter and snow pack. 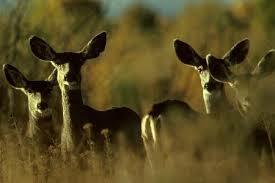 Densities can range from 12 to 270 deer per square mile. In comparison, the summer range mule deer occupy is much larger than the Boise Foothills winter range. Thus, winter range represents a smaller amount of area to support the same number of deer, and represents a critical area for the forage, shelter, and survival. Mule deer migrate from their summer range in the high mountainous country to lower valleys in order to survive the winter. The Boise Foothills are a final destination endpoint for big game during their winter migration. Cold temperatures and snow depth trigger the mule deer migration from their historic winter range in the Boise Foothills. There are movement corridors that big game utilize to access different areas in the Foothills and along the Boise River. 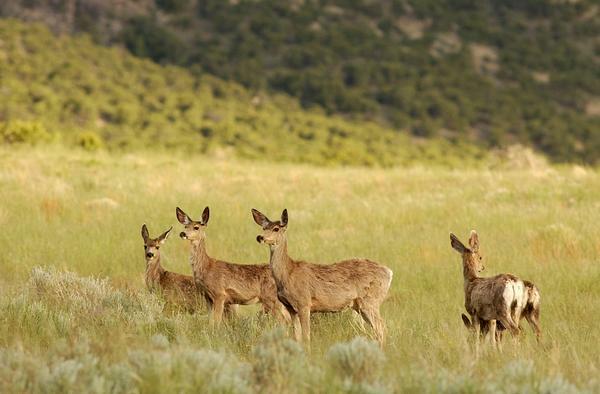 A movement corridor exists in the vicinity of Harris Ranch where mule deer and other big game species travel between the Boise Foothills and the Barber Pools/Boise River. The Boise Foothills are a final destination endpoint for big game during their winter migration. During winter months, mule deer browse on a wide variety of woody plants when snow covers many grasses and forbs. Common browse plants include bitterbrush, sagebrush, aspen, dogwood, juniper, and Douglas fir. They graze on various grasses and forbs heavily during spring, summer, and fall. They occasionally feed on agricultural crops. Streubel (2000) found that deer in Idaho showed a high fidelity to their summer range, but less so to their winter range; deer from one summer range migrated to different winter ranges. Big game winter habitat in western North America is defined as south facing areas of mild to medium slopes (Thomas et al. 1979, Hoover and Willis 1987, Mowat 1999). Lower elevation habitat in the Foothills are very important during hard winters as deer try to avoid deeper snow, which can hamper their abilities to find forage and quickly deplete their necessary fat storage. Small changes to the lower Boise Foothills can have large repercussions for big game winter range across a broad area, especially during hard winters. Mule deer that come to the Boise Foothills winter range attempt to conserve stored energy in order to survive the hard winter months. Winter range is used as an area to reduce movement and forage, ultimately to maintain an energy level that prevents potential starvation.